I’ve been fascinated by our civil war since I first found out that Americans were killing Americans in combat here in America. I’m not exactly sure when I discovered this — I’m sure it was later than most southerners, as the war itself is far less ingrained in the minds of the young up here in Wisconsin. It was my 8th grade social studies teacher, Mr. Derus, who gave me my first hard lesson on the war between the states, and ever since I haven’t gone more than a few days without thinking about the subject, talking about the subject, learning about the subject. As a Wisconsinite, my position on the war has always been that of a pale pastel, just a bit of pure Americana that happened to be the biggest catalyst in shaping our nation today. I’ve never felt the anger that many southerners feel, even today, about losing their bid for independence. I’m sure that a few of them reading this post will feel their ears burn when I mention that Lincoln violated the constitution by suspending habeas corpus by throwing the Maryland secessionists in jail without trial. Right now, these same folks are thinking of all the other things Lincoln did that made him evil in their eyes. As a white man, I won’t even try to convince anyone that I can relate to the plight of the African-Americans at the time of the war or in today’s world. Yes, I know the history. Yes, I understand what racism is, what slavery is, and I understand what hate is. 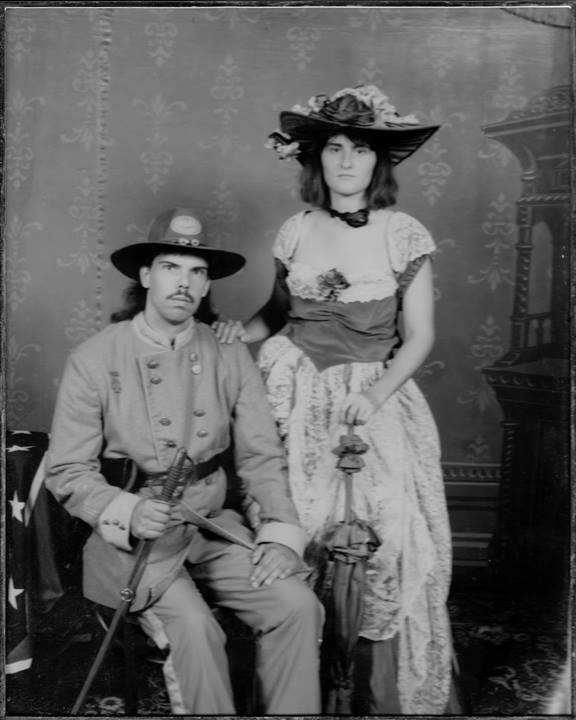 When we were 21, the woman who would later become my wife and I went to one of those old-time photo shops while we were at the Wisconsin State Fair. Neither of us had ever done this before, and we had fun playing dress-up and posing for the camera. Since I’m a “Union man” by birth, I decided to go with the Confederate uniform instead, as the allure of being a Rebel was too much to pass up. We bought the photo, had it framed, and it hung on our wall for over twenty years. Today, I manage a Facebook page that is dedicated to the “Iron Brigade,” one of the most celebrated Union brigades to fight in the civil war. Staring at the photo of my wife and me in southern garb one night last November, I decided to pull it down, scan it, and use it as my profile picture on Facebook. I’ve always liked the photo. I look good in it, and the mullet I’m sporting could actually pass as the long hair worn by many of the officers and soldiers of the Rebel army. The photo attracted a lot of attention, mostly because it’s over twenty years old and people were giving me grief about my age and my hair and my lack of hair in today’s world. A lot of friends simply “liked” the photo, including one of my African-American friends, a friend whom I haven’t seen in person since 1994. We’ve been Facebook friends since April of 2010. Damn. Why did I upload that photo? Why couldn’t I have worn blue instead? What kind of image does it send to people that a Wisconsin boy is wearing the uniform of those who had fought to preserve slavery? We all have our prejudices. Those who claim otherwise are either in a box or they’re lying. But there are stark differences between being prejudiced and being a racist… and I’m not a racist. I would NEVER fight for slavery. My friend “Liked” the photo even as he commented on it. Knowing him, and knowing that he knows me, I don’t think that he thinks I’m a racist. It is my deepest hope that he would have said the same thing had the uniform been blue and the flag had been the Stars and Stripes rather than the Confederate Battle Flag. Now, the kicker: I haven’t ASKED him about it. I’m afraid to even approach the subject with him, as I’m afraid of how trite I’ll seem, how ignorant I’ll seem, how downright stupid I’ll seem. But it doesn’t matter how he sees me, because I am the one wearing the uniform. It is the perception that is important, not the person holding that perception. Don’t misunderstand me, I’m not saying that my friend’s opinion isn’t important. I’m saying that it’s too late for me to take off the uniform. What if I’d dressed up as a Nazi for Halloween, instead?